Snow.y is a white label software solution designed to be the best snow removal software solutions. Its excellent and practical features were crafted keeping all the requirements for snow clearing needs. When your mobility is hampered by continuous snowfall or because of snow storm, Snow.y is the software you need to provide snow removal services. It is designed with convenient and well researched features to give you a complete Uber like experience for snow removal. View a live map view of available snow shovelers near you, based on your location. An alternate ‘List View’ depicting online & offline professionals with their ratings, is also optionally provided. 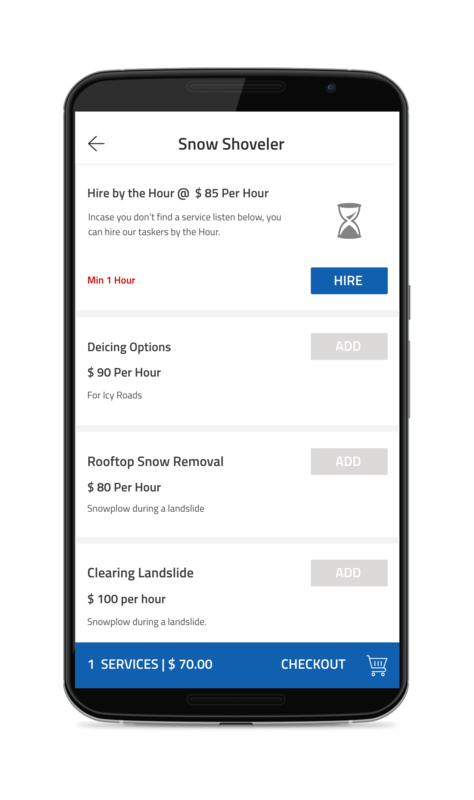 View a filtered list of available & later available snow removal professionals with their ratings, based on your preferences. 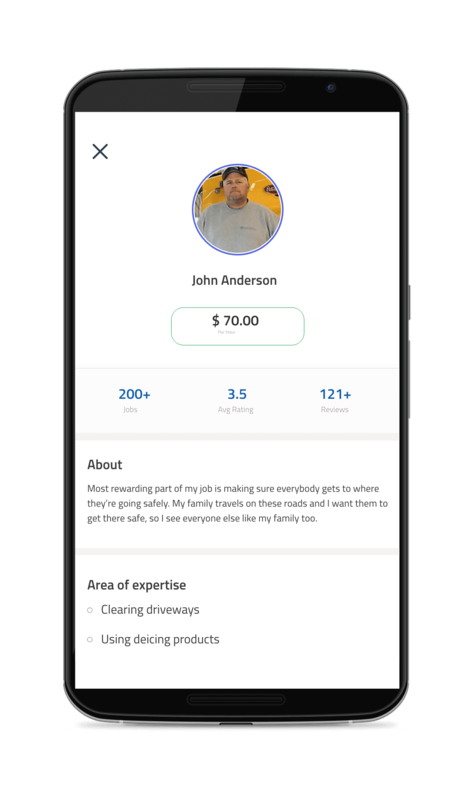 Users can view a detailed profile of their snow removal professional who have been background-checked. 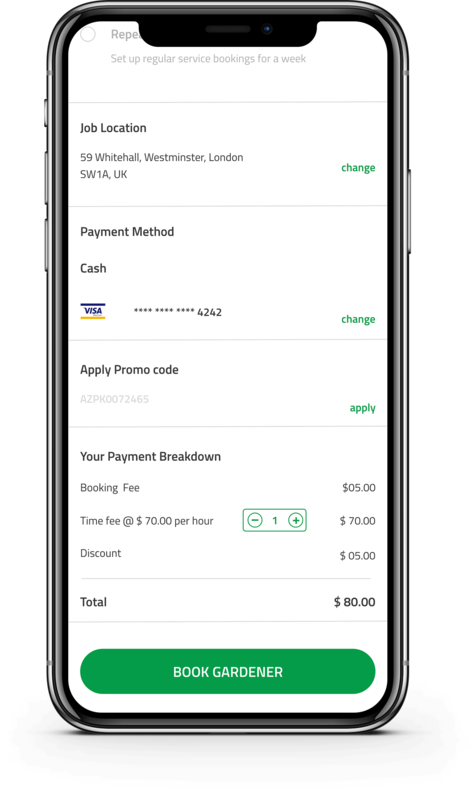 Once selected, users can add additional service requirements, change payment options, schedule the service, add promo codes etc. Each snow removal requirement offers a variety of services. 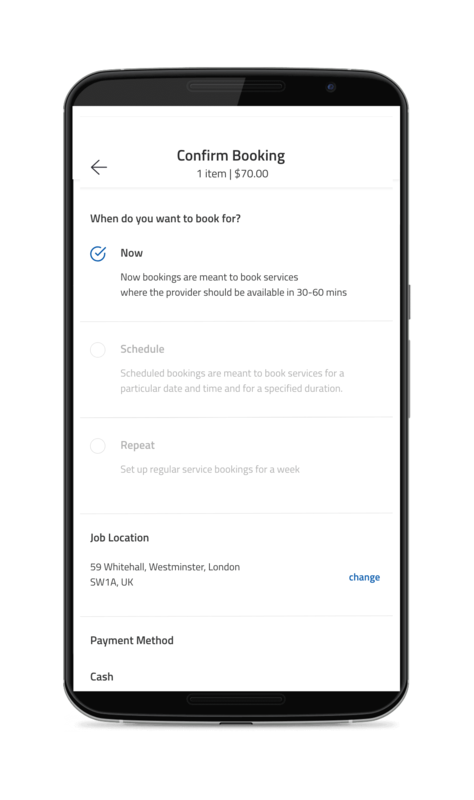 Users can book professional by the hour or services needed with their individual rates provided. 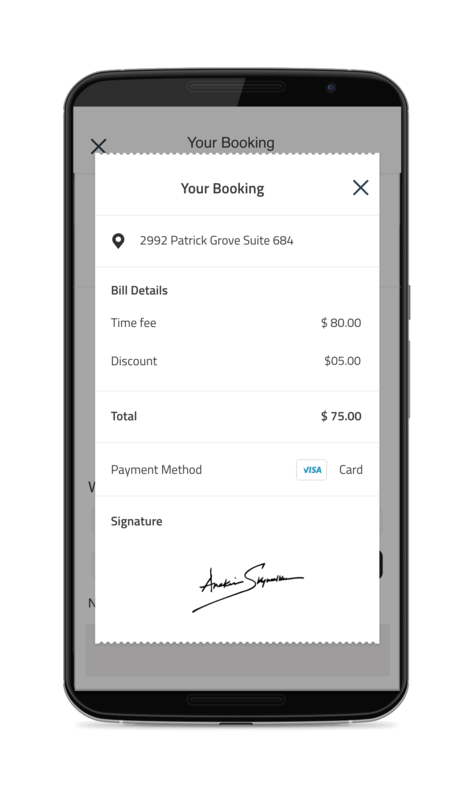 Choose from a list of payment options, add additional services and provide promo codes if available. Learning from leading snow plow apps- Snow.y provides a detailed UI for each assigned snow removal professional. Complete with live job notifications, live tracking & in-app chatting. 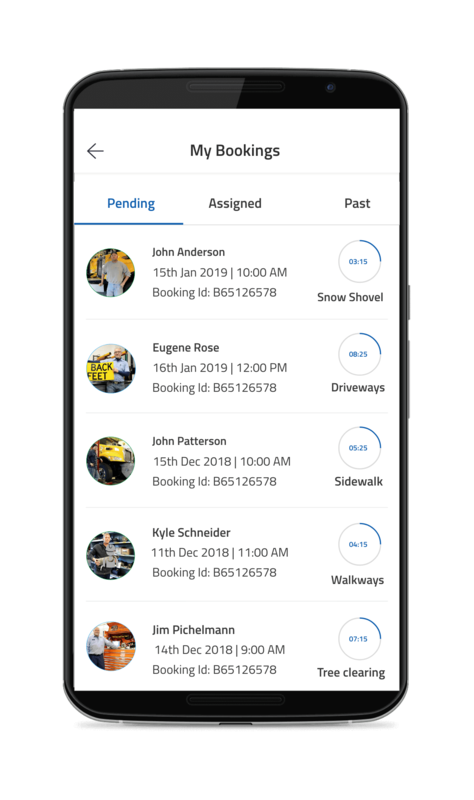 Our Uber for snow removal software lets users view the status of their active bookings. In-app notifications are also provided on each status change. Live map view of your assigned snow removal provider. 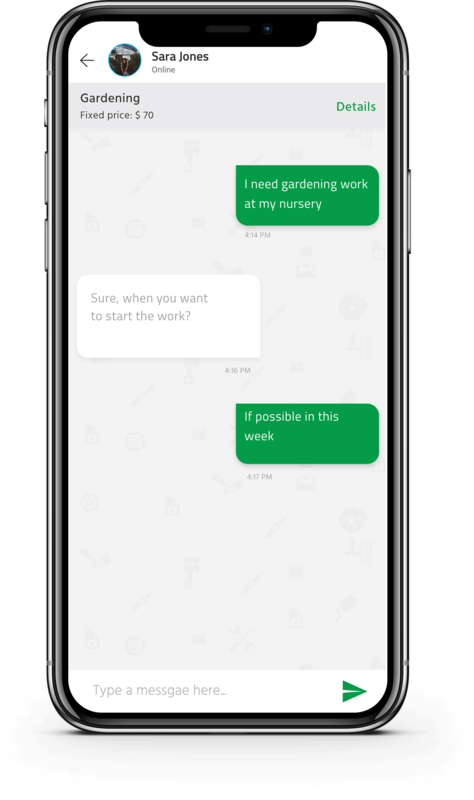 In-app chat module integrated with our Snow.y app. Useful when special instructions need to be mentioned to the snow clearing professional. 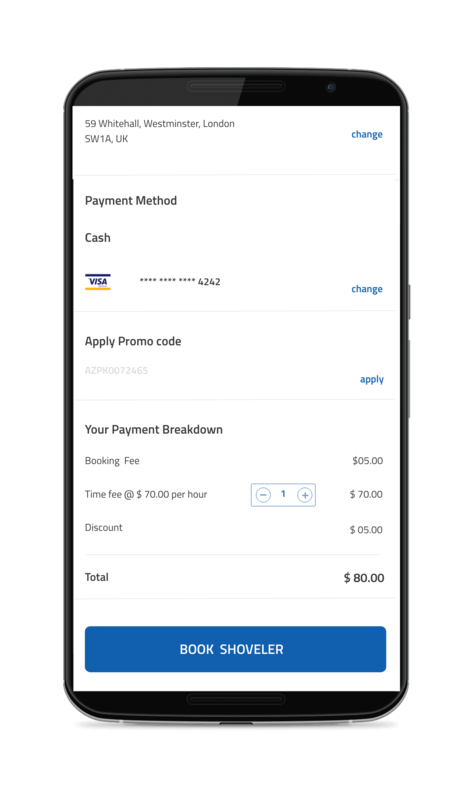 Once the snow clearing services, snow plow service is completed, users can review their invoice details and rate their professional as well. View a detailed invoice of the snow removal service provided. Our live snowplow software finder view lets users view various snow removal or snow plowing professionals near their locations. Users can also select their snow clearing service based on various filters and schedules. Select the category of your snow clearing requirements such as rooftop, driveways, sidewalks, walkways etc. View the details of each snow plower professional, their past reviews, past job photos etc. Each snow plowing professional usually offers a variety of services. 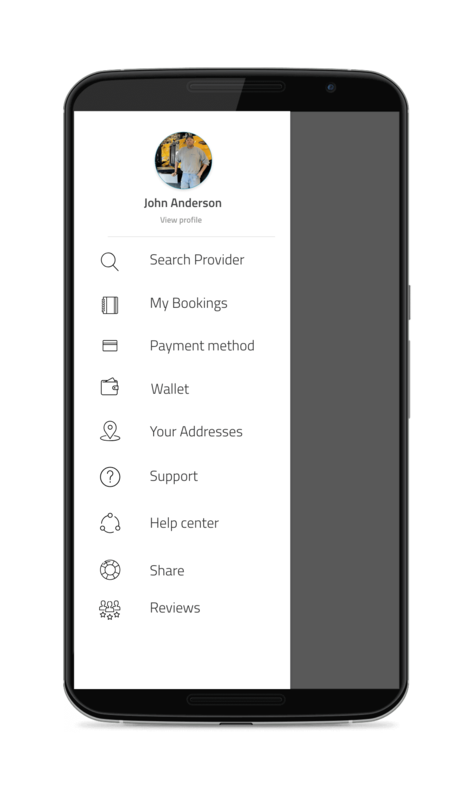 Users can book their professional by the hour or by the services needed with their individual rates provided. Various scheduling options are available. 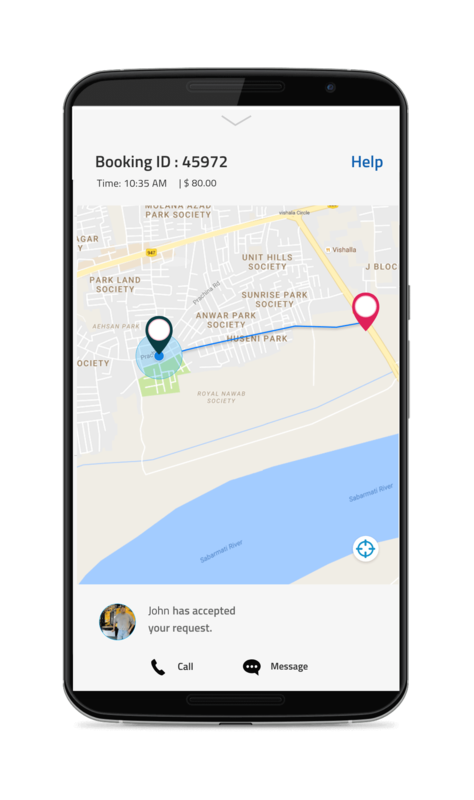 Allowing users to book their snow plowing service on-demand, for a later scheduled date or even on a weekly repeat booking. Keep a record of all the bookings placed. 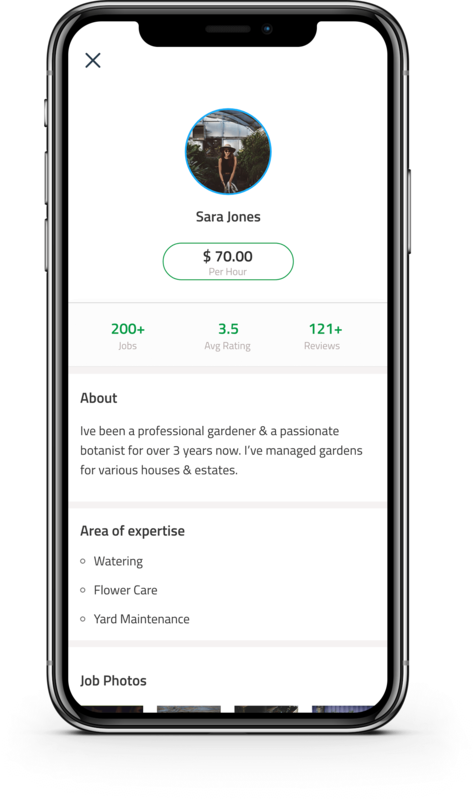 Once the professional accepts the job from the Snow.y app, the job is then assigned. 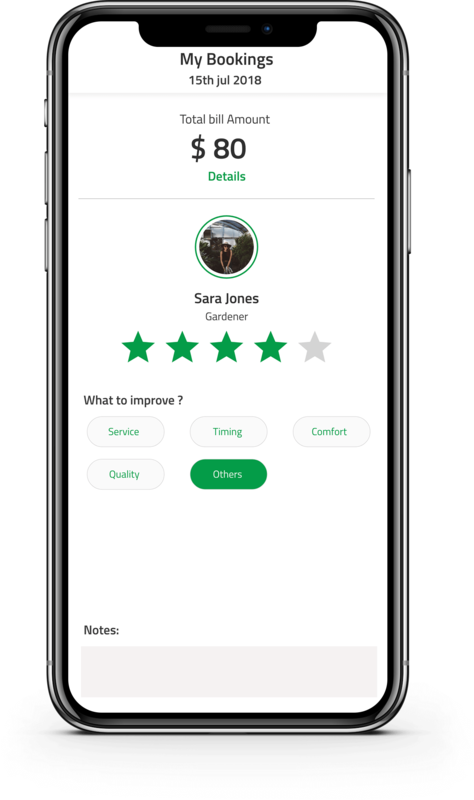 Learning from leading snow plowing services apps Snow.y provides a detailed UI for each assigned snow clearing professional. Complete with live job notifications, live tracking & in-app chatting. 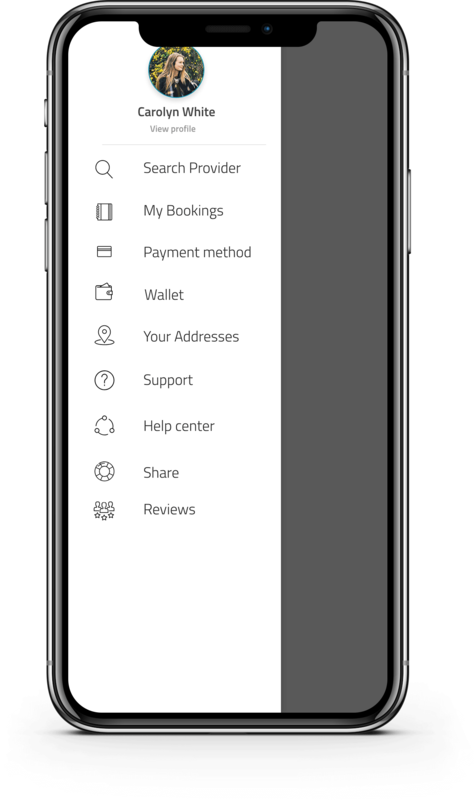 Update addresses, payment options, recharge in-app wallet, get in touch with support for bookings etc. Users can provide referral codes to friends or family to avail special discounts/offers on snow removal services. 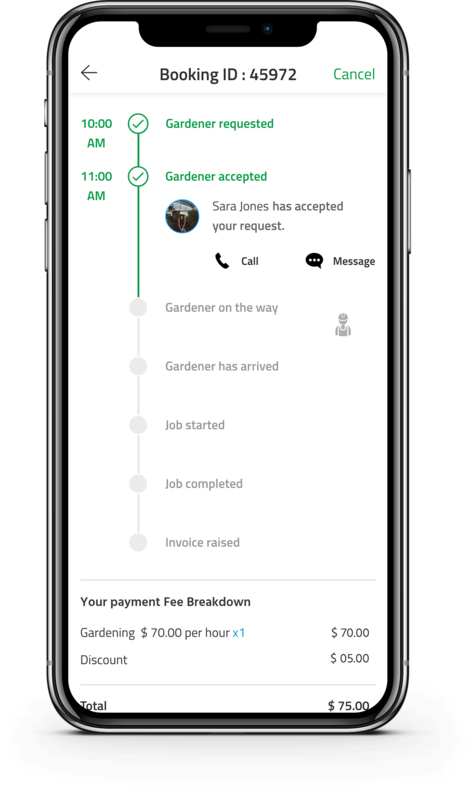 View a detailed invoice of the lawn care or snow removal service provided. Provide feedback & rate your snow removal professionals on a variety of service fields. This ensures high quality standards are maintained on your customised Uber for snow removal application. Setup and manage fares for snow shovelling, snow clearing etc based on cities, service type or hourly rates. 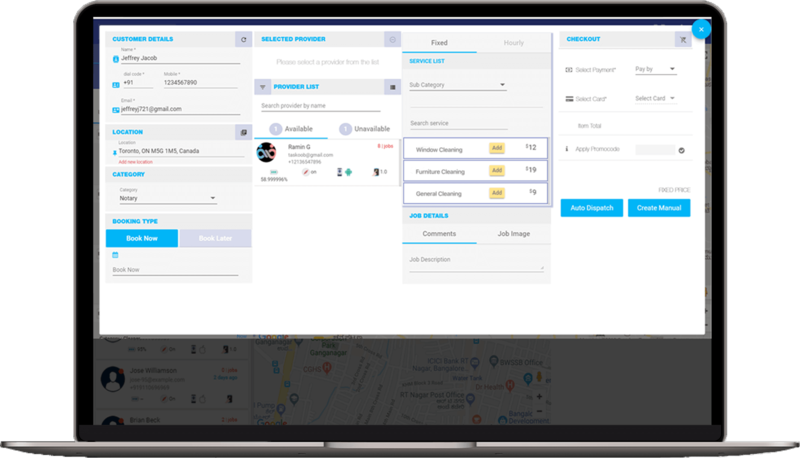 Setup and manage promotion codes and referral campaigns on your custom Uber for snow removal services platform. 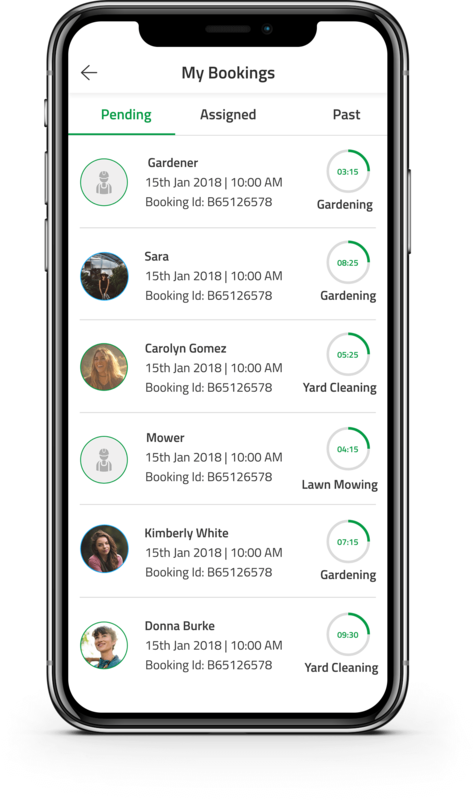 View all snow care, plowing, shovelling etc service bookings in real time as they are being placed. 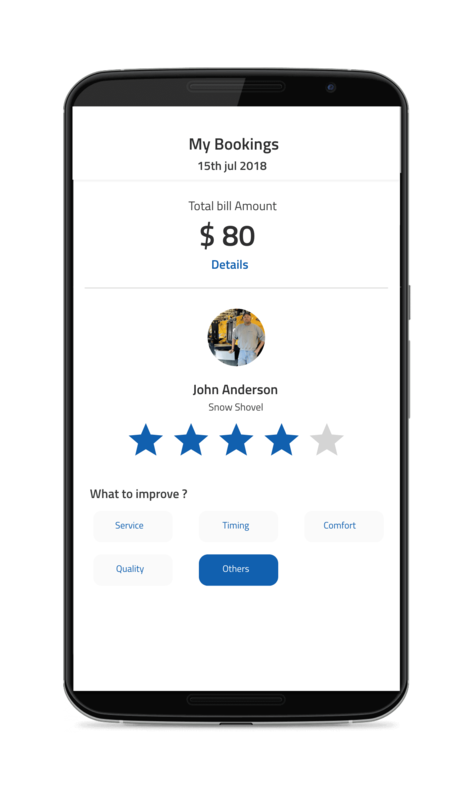 Complete financial accounting system to keep track of earnings for various snow removal professionals registered on the app. Payroll management system integrated in our Snow.y software, to manage cash & card earning for snow clearing service providers with direct payment to their respective bank accounts. Manage various snow removal service categories present on your customised snow removal application. 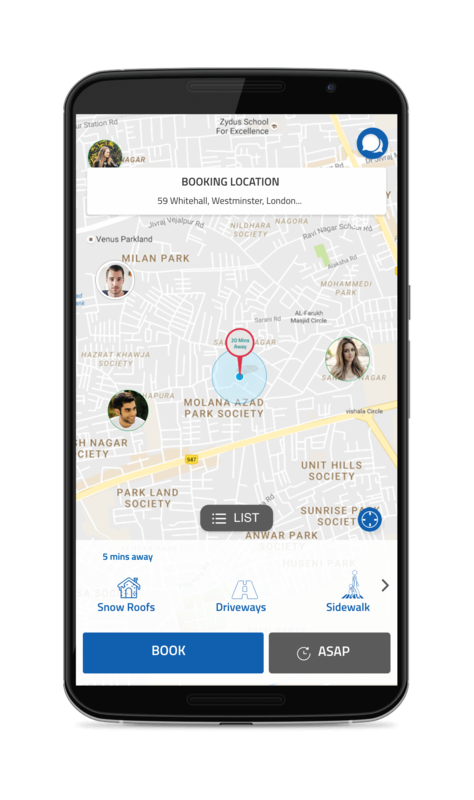 View all bookings & trips in real time on a map across cities or zones. Create zones for your service by drawing polylines on a map and set rates accordingly. 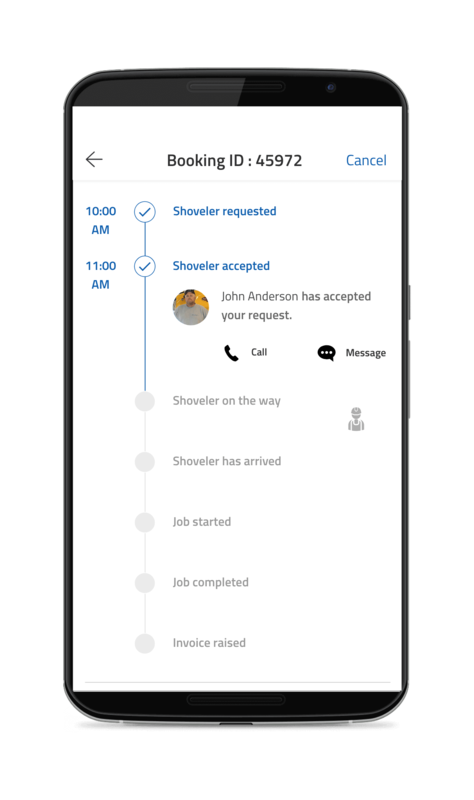 Push messages to snow shovelling service providers and customers directly from the admin. Keep a tab on the various snow shovelling service providers and maintain high quality standards using ratings and reviews left by customers. 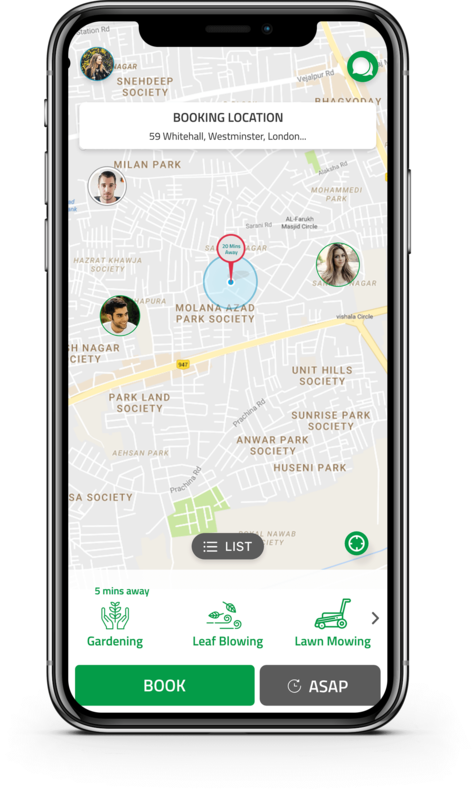 Setup various app commision rates based on zone, service type, fares etc on your Uber for snow removal app. WHY CHOOSE SNOW.Y AS YOUR ON-DEMAND SNOW PLOW SOFTWARE SOLUTION? Snow.y not only encompases the best features needed to stand out but is backed by an extremely robust & scalable technology architecture, developed by us, as well. 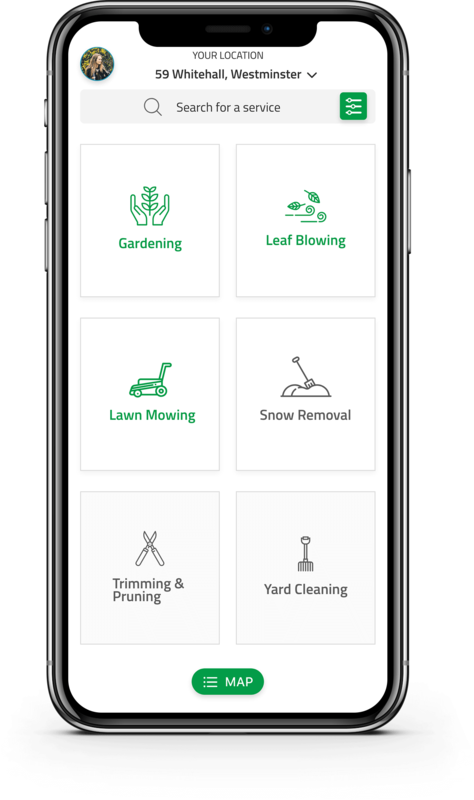 Our Uber for snow removal solution is customizable to build a variety of yard work-related services. It is 100% customisable to your snow removal needs. 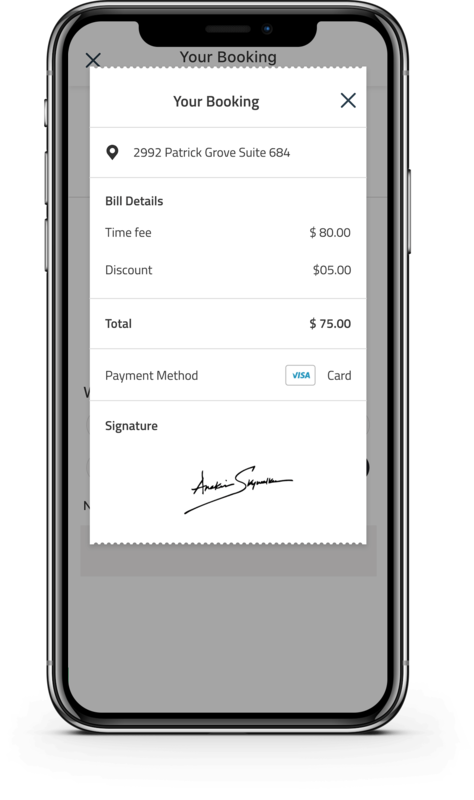 We assure PCI compliance so you will have not legal issues accepting in-app purchases when booking for snow removal services near you. Using our proprietary Pre-Built IP solution, we move our customisable app & software from development to deployment faster than any other on-demand snow removal software developers out there. 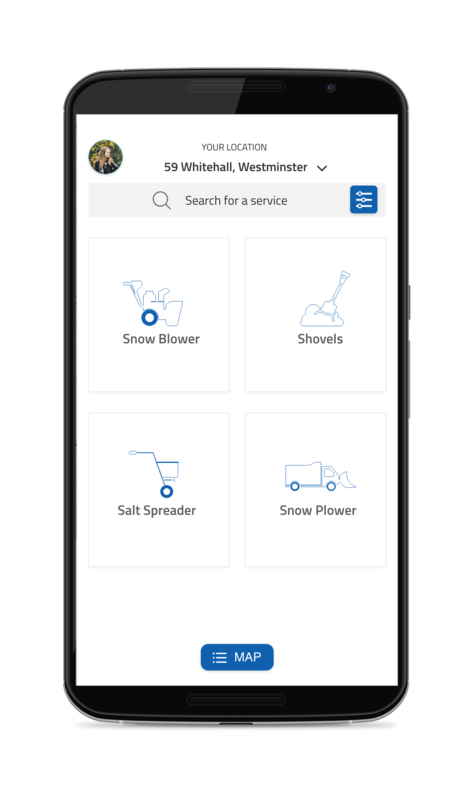 Using state of the art app container technology, clean coding practices, microservice architecture, while simultaneously promoting safety & security on the app – Snow.y is the best on-demand snow clearing software solution, available in the market today. 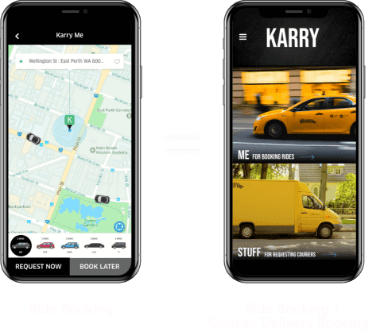 Whether you want to launch your custom Uber for snow removal or snow shovelling app in German, Arabic, Chinese etc we ensure our script can be deployed in any language preference. 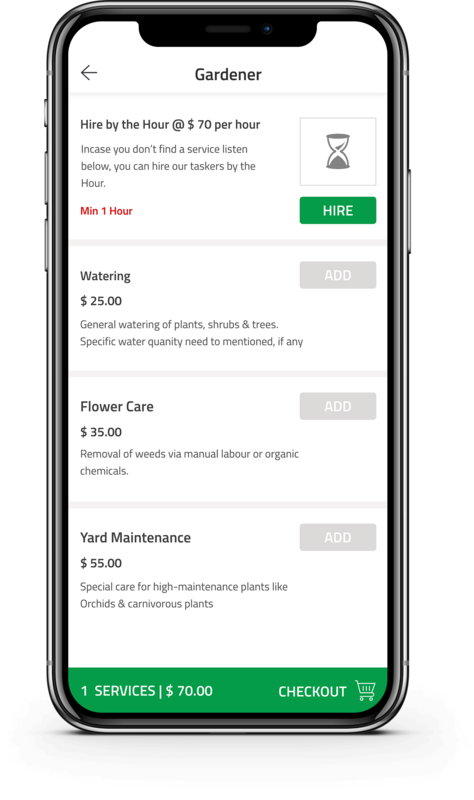 Increase your snow shovelling services app userbase + overall retention via referrals and promotions features. Our underlying tech architecture ensures our white label snow plow software on-demand script is scalable with the growth of your professional snow clearing services. 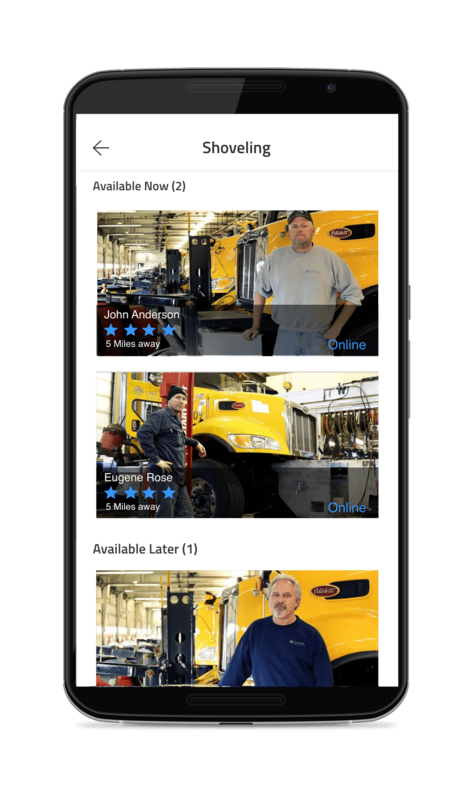 All white label apps developed using our Uber for snow removal solution are designed to ensure that every tailored on-demand solution we make, sticks out in both search engines & app stores. 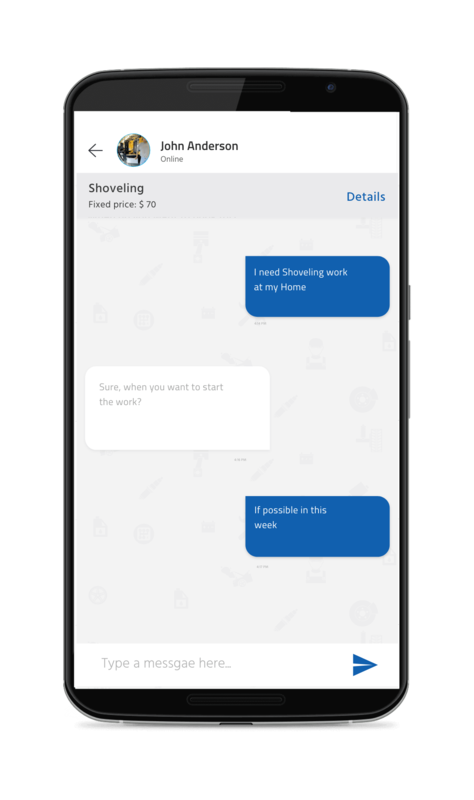 Our Snowplow software solution is the only ones in the market to provide app monitoring services with chatbot integration. Ensuring you can get instantaneous performance updates on your tailored snow shovelling app. Our white label snow shovelling software solutions are not only robust & scalable, but extremely secure as well. Keychain, SSL-powered API’s, JWT, reverse proxy setup etc ensure that security covers the entire app to each individual API. Native Apps with MVVM architecture via Swift 4 & RxSwift. Declarative coding via ReactiveX enables us to describe complex asynchronous workflows at a high level in a few lines. API’s are written in pure Node.JS, following the best clean coding & MVC clean architecture guidelines. We additionally use Node.js for our app performance monitoring services as well. Using Docker for our app containers, you can build, ship & run the app, anywhere. Our app containers are based on shared operating systems and microservice architecture. This makes it much more efficient in terms of system resource utilization and additionally, utilizes the server-worker model for super scale and performance. Provided via open source message brokers. Ensuring every function call runs immediately and seamlessly in the app. Perfect for any kind of on-demand service provider. 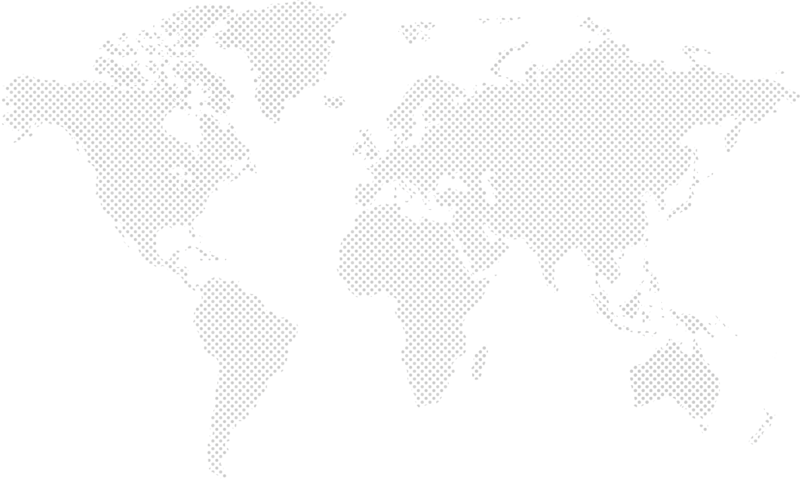 Distributed database with high availability, horizontal scaling, and geographic distribution that is built in and easy to use. This ensures the application can handle large user volumes during userbase growth. Most secure app infrastructure in the market where security extends from the mobile app to the API’s. 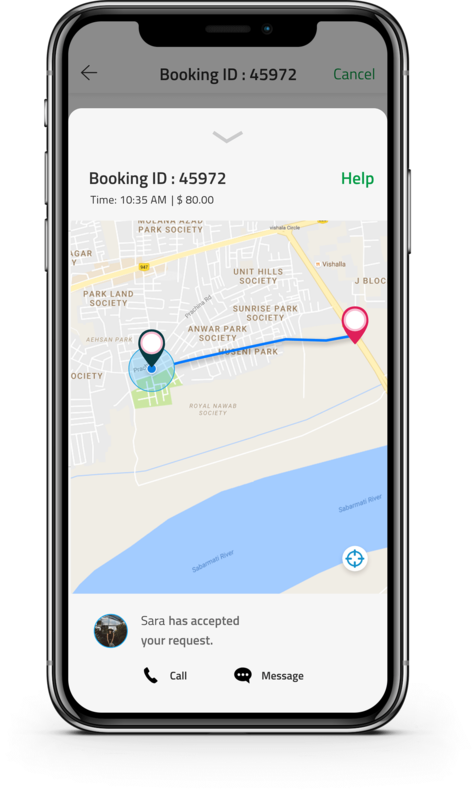 Use of keychain in the iOS to store all credentials, SSL powered API’s, use of JWT for the API’s, reverse proxy setup on the load balancer, proguard on Android etc. Using our proprietary Node.js Application Performance Monitoring(APM) service, you can can easily monitor your app as well as detect and react to potential issues beforehand. By monitoring the app on a service/host/instance level - Our APM services ensure that your app is always on the top of its game. We’ve integrated our APM features with a Slack bot. You and your team can receive immediate updates on the status of the application, at any given time. You can additionally request the Slack bot to give you app performance updates. 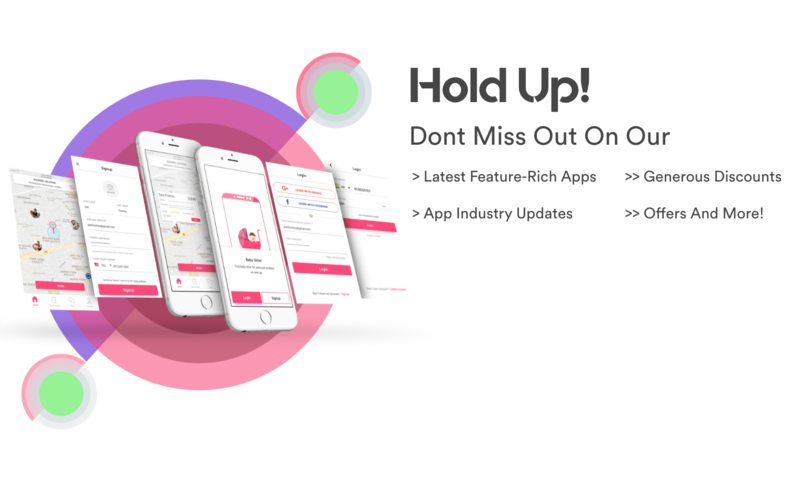 We ensure that the app is completely functional at the end of the day with each milestone depvered to you as quickly as possible and clear communication between you and our team. We implement Jira for project management, Bitbucket for version control, Slack for monitoring and communication, Skype for conferences and quick chats, Scrum board/Sprints for task management and Crashyltics/Fabric.io for bug reporting etc.